Otters are members of the weasel family, usually found in pairs or family groupings. Their ears and nostrils seal shut when under water. 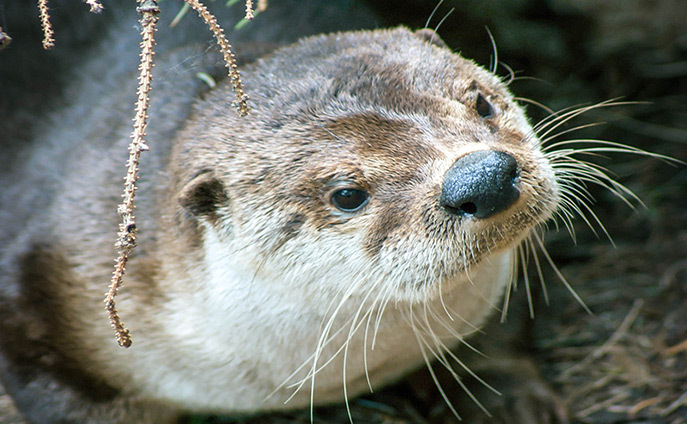 A nictitating membrane (transparent third eyelid) protects the otter’s eyes while swimming. A thick layer of fat insulates them from the cold. Natural predators include bears, cougars, wolves, coyotes, and in the southern United States, alligators. Otters are hunted for their fur and are affected by water pollution. River otters are well adapted to their water environment. Their webbed feet are used for propulsion while their tail steers them. These otters rely on their sensitive whiskers to find prey in murky water. Their high metabolism requires them to eat often. River otters are often wrongly blamed for depleting commercial fish stocks; their diet actually consists of non-game fish species such as suckers, chubs, shiners, catfish and perch.